No, house prices shouldn’t be a consistent multiple of income. 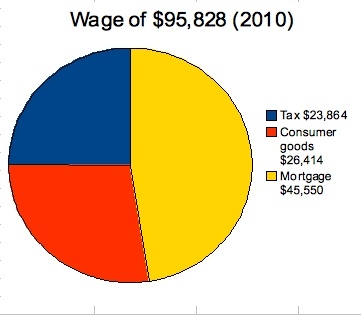 At least, not wages but closer to household income. In the 1950’s, most homes were single income homes. Nowadays, most homes would be 1.5 – 2 income homes. This is one reason how households can afford bigger mortgages. In 1950, an average wage might have been 1,500 quid when house prices might have been 2,500 quid (grandfather’s experience in Moorabbin, Vic.) 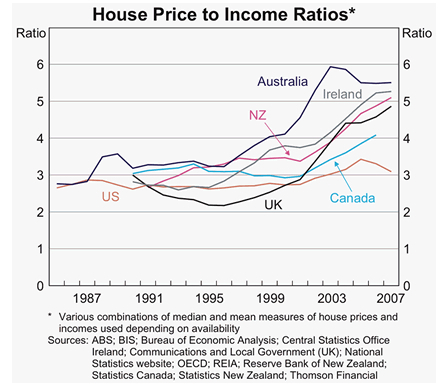 So, average house prices less than 2 times average wage. 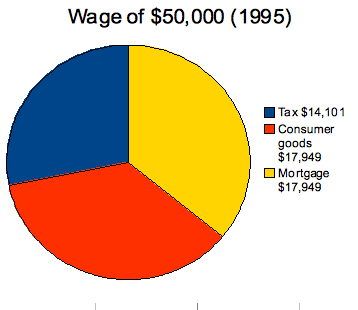 I think your argument that portion of income available to go toward housing is correct. I guess the increase in technology has allowed greater production and consumption of G&S without a commensurate increase in cost, allowing more income available for housing. Damn, Adelaide is a bargain! An interesting phenomena is that land has historically increased in value at approx. 7% pa whereas incomes have increased at perhaps 4% since mid 1970’s. This growth discrepancy means that the cost of financing a home must consume more of our incomes. This cost of housing increase necessitates greater household income. It coincides with social pressures and liberties for more women to go to work. Or is it supply driven, forcing women to go to work to keep up with the Joneses? I’ve had a thesis since the mid 90s (when interest rates were pretty high), that the overall trend of interest rates will be forever down. My reasoning was (1) Japan is the canary in the coal mine. (2) Governments and central banks will always juice the economy with lower rates to avoid recessions, but they’ll never raise them enough to cause pain. Rates are not really market driven, they are driven politically, and politically its easier to move down than up. (3) The economy adapts to low rates by taking out massive loans. To then raise rates would crush the economy. Thus the low rate regime gets baked in long term. All of my predictions have come to pass with rates getting to zero in many jurisdictions, , and even notionally negative in some countries. I don’t think anybody knows what comes next. If we look to Japan again, rates go to zero and stay at zero, and then debt just keeps growing forever. But intuition says this must somehow end.